Born in Glasgow, Ansbro followed up several promising seasons with Northampton Saints with a Scotland debut against South Africa in a famous Murrayfield win in 2010. Adept at outside-centre or on the wing, Ansbro had previously won two Varsity matches in the colours of Cambridge, where he undertook a degree in natural sciences. 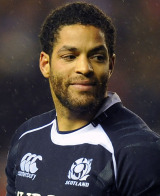 He confirmed his allegiance to Scotland by accepting a place in their 'A' side for a successful run to the IRB Nations Cup title in 2009 and remained in the thoughts of selectors for the 2010 November series, in which he ultimately won two caps. He was named in the starting line-up for Scotland's opening Six Nations game against France in February 2011, the same week that it was announced that he had agreed to join Premiership side London Irish. Ansbro showed exactly why the Exiles had been so keen to sign him by turning in a hugely impressive display against Les Bleus. Injury interrupted the rest of his Six Nations campaign but after playing an important role in Northampton's run in, he was named in Scotland's provisional squad for the 2011 World Cup. Ansbro was selected in the centres for Scotland's opening World Cup warm-up game against Ireland and he duly scored his first try for his country, sealing the win for Scotland. Ansbro will join London Irish for the 2011-12 season but will go to the World Cup first with Scotland.